On a cold January night in 2003, I was in Denver, Colorado, for a Campus Crusade winter conference. All the cool kids wore Abercrombie and had flip phones, and under the influence of Joshua Harris’s book about relationships, I had kissed dating goodbye. After dinner that night, I spoke with a girl named Brooke about dating—I mean courting—and whether God had marriage in our future. He did, and we’ve been married for a dozen years. A lot has changed in the last 15 years. Crusade is now Cru. Having a flip phone might be cool, but in a retro kind of way. Yet for all the changes, much stays the same. Whether you call it dating or courting or something else, the “way of a man with a young woman” (as Proverbs puts it) is still a beautiful, mysterious thing, like a ship sailing across the sea (Prov. 30:18–19). But like the high seas, dating can be dangerous, leaving people with bitter and broken hearts. 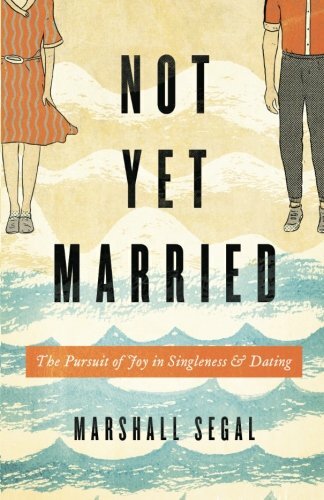 That’s why I’m thankful for Marshall Segal’s new book, Not Yet Married: The Pursuit of Joy in Singleness and Dating. Segal, staff writer and managing editor for desiringGod.org, is newly married, but he isn’t just another married guy telling singles what to do. “I wrote a lot of this book, and learned almost all of the lessons before I married my wife,” he explains, establishing his singleness credentials (16). Not Yet Married has two parts. The first is “the not-yet-married life.” Here Segal channels many of Desiring God’s hallmark themes—passion and purpose, joy in mission, and the glory of God—and applies them to singleness. In the second part, “when the not-yet-married meet,” he deals with the particulars of Christian dating.